DUE TO THE OVERWELMING SUCCESS OF OUR JIGS AND SOFT PLASTICS WE ARE UNABLE TO OFFER GUIDE TRIPS ANYMORE. IF YOU ARE IN NEED OF SOME GUIDES HERE ARE A FEW WE STRONGLY RECCOMEND. Pro Guide Paul Ambrose Owns/Operates Great NW Rivers Guide service. 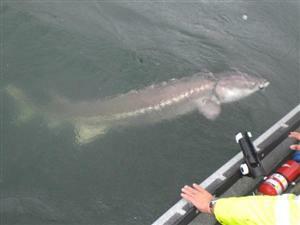 He offers FULL day trips on the Columbia River for Salmon, Steelhead, and Sturgeon. He fishes from his Custom, 23ft Koffler jet sled built for fishing. His trips offer a custom barbecue Lunch with your chioce of meat. He also offers a frequent fishermen card, book 5 trips, get the 6th free! In additon he also has a referal program.. refer people and you get a trip on HIM! NIC NORBEC IS AN AMAZING GUIDE AND WILL DEFINATELY PUT YOU ON THE FISH. FROM BEGINER TO OLD PRO'S ,NIC HAS TRIPS FOR EVERYONE. Travis Milward owner/operator based out of South West Washington offers first class River fishing for Salmon, Steelhead and Sturgeon. 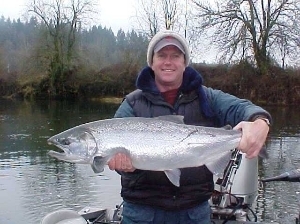 Fishing only the peak runs on the west coasts best rivers like the Columbia, Lewis and Cowlitz Rivers you are guaranteed a trip of a lifetime. Fishing with new age innovative techniques, using top of the line gear and seated in a heated 22ft jet boat Travis can accommodate up to 6 anglers in his boat. If you are doing a family trip or a corporate group he also has guides that work for him that can fish groups as large as 30 or more.